The ESP8266 is a low-cost Wi-Fi chip with full TCP/IP stack andmicrocontroller capability produced by Shanghai-based Chinese manufacturer, Espressif. 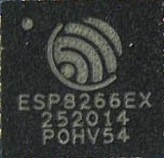 Starting in 2014 several modules based on the ESP8266 chip have been produced. Initially most of the modules were developed by AI-Thinker. With its low cost, there have been an abundance of manufactures creating modules which loosely follow several patterns. AI-Thinker has produced at least 14 different modules based on the ESP8266 to date. With there being at least 15 other modules produced by the likes of Adafruit, SparkFun, ESPert, and NodeMcu. Which Module Do I Need? YES - Do you need built in USB-To-Serial? NO - Are you going to use a breadboard? NO - Do yo need more then 2 GPIO pins? If you need FCC approved equipment your only real choices seem to be the ESP-12 & NodeMcu modules.